Cornwall is one of my favourite areas of the UK. I’ve visited Cornwall every year since I was 8 years old, and absolutely love the Cornish surf vibe. 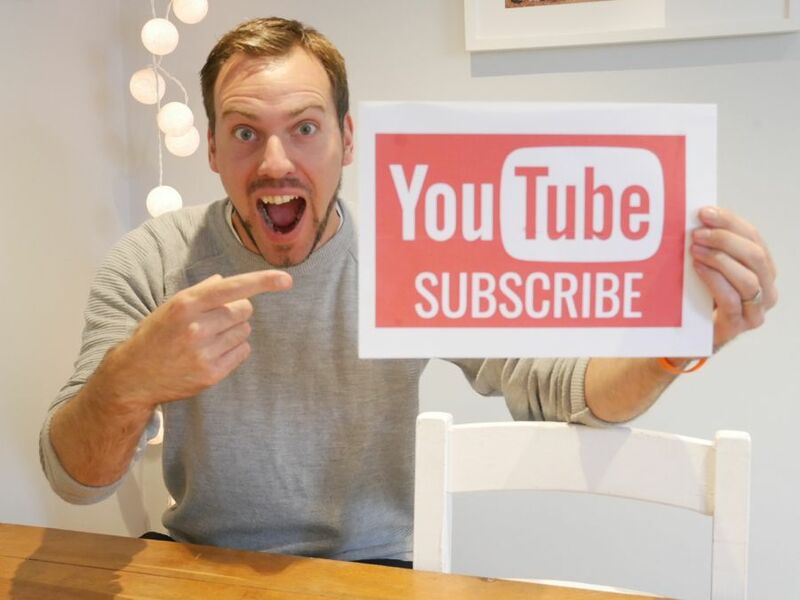 There some incredible hotels and Airbnb accommodation in Cornwall, but with such a rich history and amazing coastal scenery I wanted to find some more unusual places to stay. 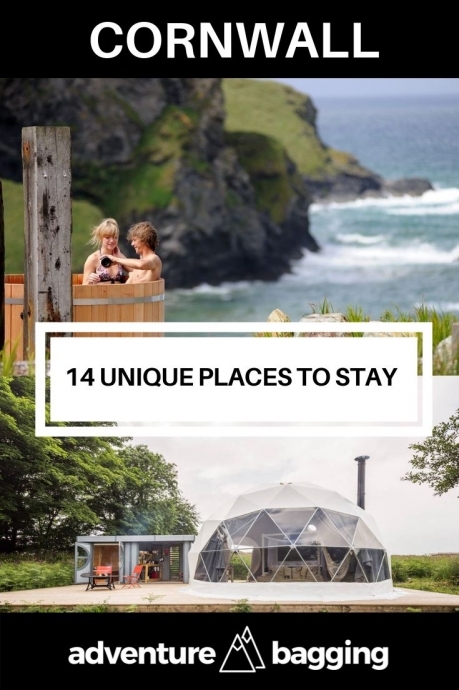 So if you’re looking for something a bit different, I’ve found 14 unique places to stay in Cornwall, including some stunning sea view properties, to bunkers, eco-pods and tree houses. 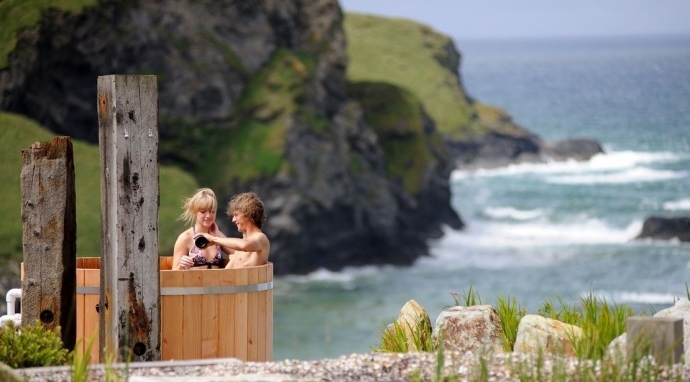 These unique places give your holiday down in Kernow something different, and with many having a rustic and outdoorsy vibe, I think they are pretty cool! Sometimes the best places are the hidden away, and that is certainly the case for Gwel-an-Treth. 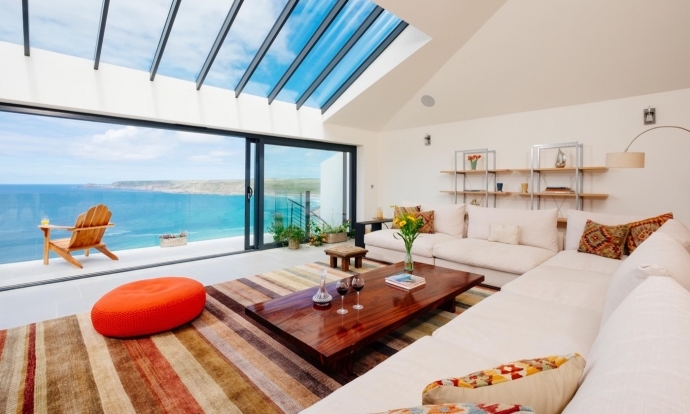 Located in Sennen Cove (which features more than once on this list) near Lands End is the incredible Gwel-an-Treth, a newly-built open plan house with uninterrupted views of the Cornish coast. Imagine the sunsets here!! 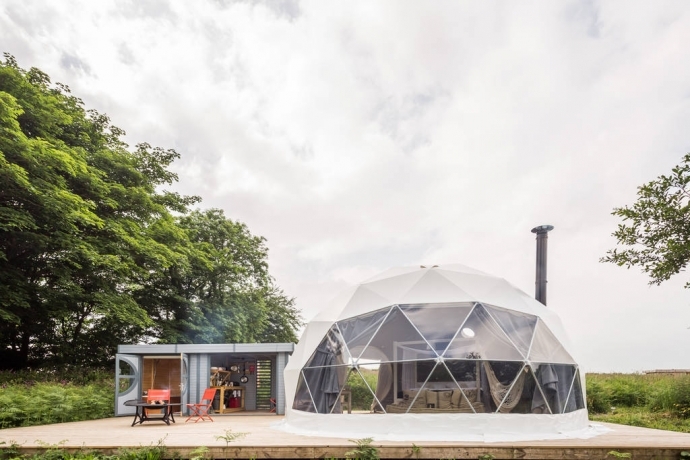 It sleeps 8 people, but start saving those pennies – prices start from £2500 per week. 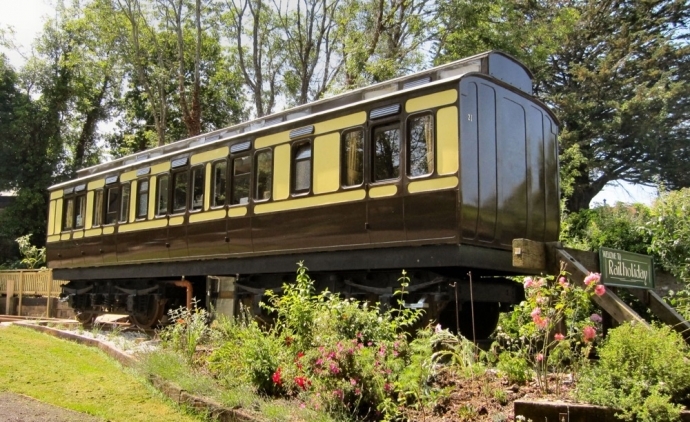 Fancy staying in a train carriage? Meet Mevy, the Victorian slip coach, situated at St. Germans, close to Plymouth. This 1896 GWR slip coach provides accommodation for up to 5 people. With a first, second and two third class compartments, as well as a guard’s room, and all the compartments have been individually restored and furnished. How about this for a back to nature cabin? 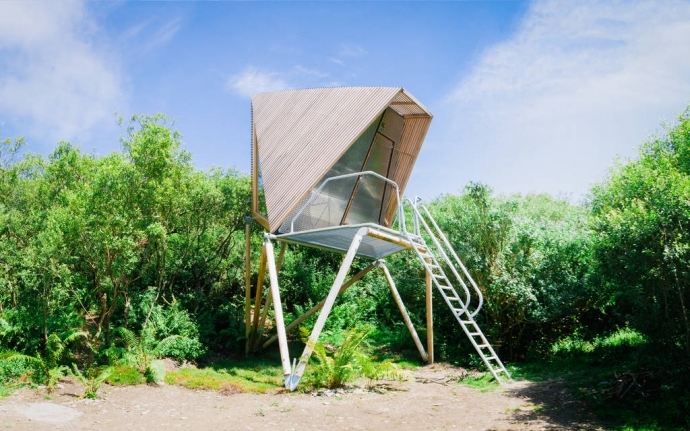 Check this place out on Canopy & Stars – an off-grid hideout, raised high above the ground, with a suspended bed with views of the coast. What’s not to love? Throw in nature, amazing views, cooking over a fire and a hot tub with views of the sea and you can see why Kudvha-K1 makes the list. The first hotel to make the list, the Scarlet Hotel near Newquay is a luxury eco hotel, just for grown ups, right on the edge of the Ocean. With a restaurant, spa and outdoor hot tub, I promise that once you follow them on Instagram you’ll be inspired to go and stay. Every room at the Scarlett Hotel boasts its own outside space, from private courtyard garden terraces to balconies, and all have views over gardens, cliffs, beach, sea and sky. They also allow dogs (in five of their bedrooms), so feel free to bring your furry friend along! 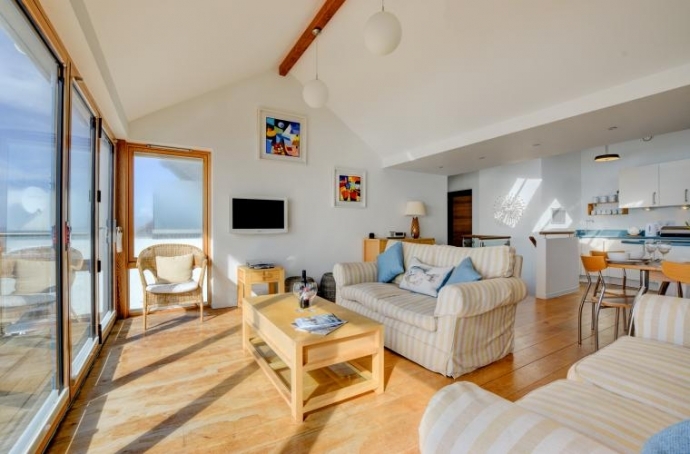 Another belter of a cottage, Ocean Blue in Porthleven is pitched as one of the most sought after holiday homes in Cornwall, and I can see why. 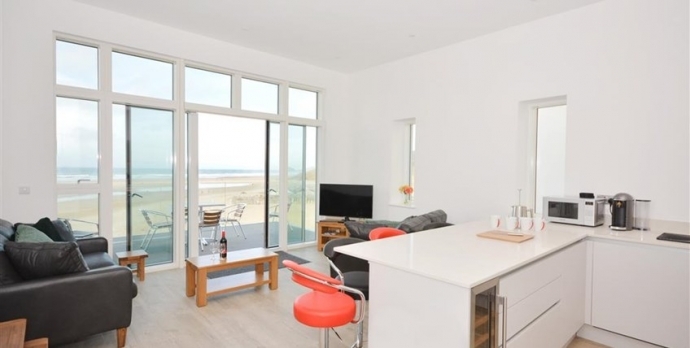 Stunning coastal views, a balcony which is literally a stones throw from the beach and very economical, starting at £700 per week. The cottage sleeps 6, but book early as their diary fills up in the summer months! The second property in Sennen, the Bunker is exactly what is says on the tin. Formerly a World War II operations bunker, the Bunker has been beautifully converted into a unique, spacious four bedroom holiday home. Whilst there is outdoor space and the entry doorway, bear in mind this is a bunker, so there are no windows in the property…but there is a natural light tunnel and ventilation system in place. Amazing! 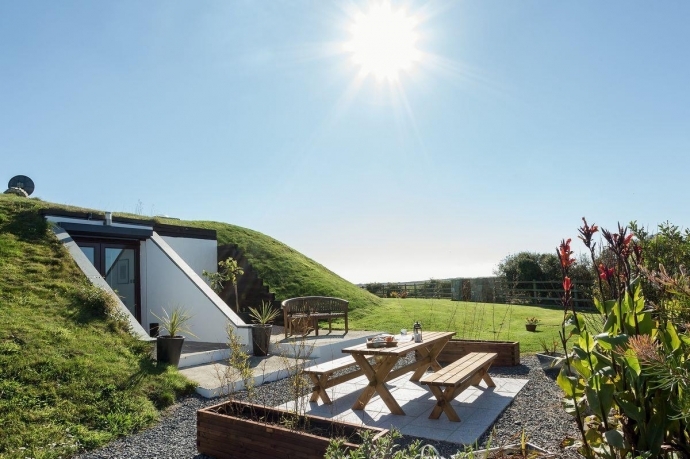 Set in the wilderness of Bodmin moor, the Ekopod at Eyl is the perfect base for strolling around the Cornish moors or the coastal heritage of Tintagel on the North Cornwall coast. 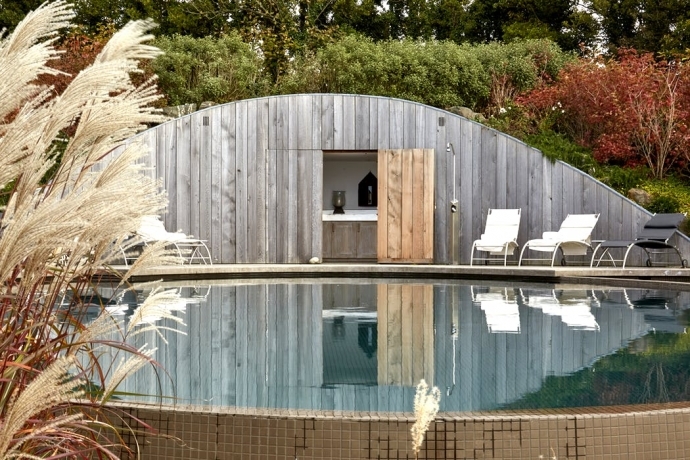 With one super king-sized four-poster bed and a sofa bed for two, you can bring your kids and dog along for a wild weekend, and watch Cornish nature from this cosy eco-pod. 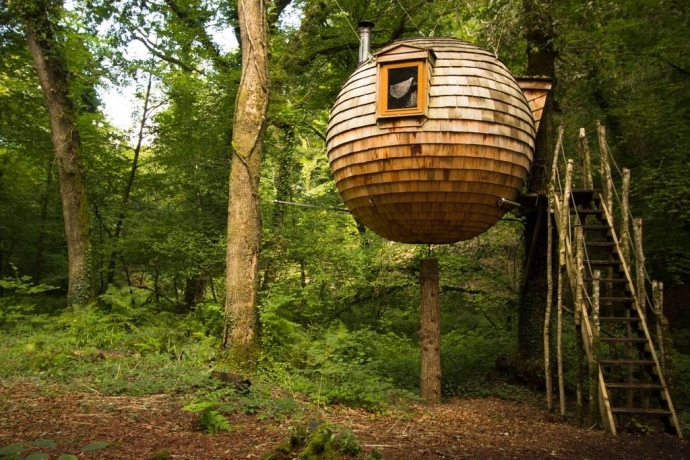 Another brilliantly unique accommodation option from the guys at Canopy & Stars, the Lost Meadow Tree Pod resembles a giant suspended bee hive. But don’t be fooled, this is a natural gem. Clad in cedar shingles, the tree pod has a wood burner for comfort during cool days and nights, and a ceiling window so you watch the stars as you fall asleep. A perfect place to get away from it all, the tree pod is located on a farm near Bodmin, and has a river to fish in and 20 acres of woodland to explore. Built within the walls of an 18th century granary, the Okelter Boathouse is a unique waterside property that has its own quay and slipway onto the River Tamar. 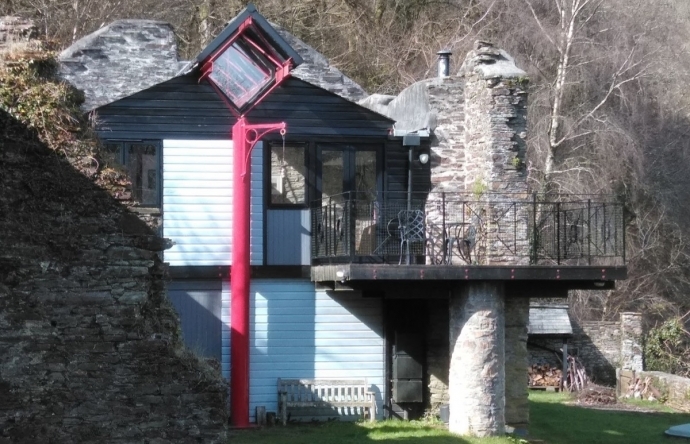 Situated near Calstock in the Tamar Valley, this is a comfortable and peaceful retreat for those who love wildlife and the countryside – with the option of exploring the river in your own boat. This amazing glass lodge has a distinctly fairy-tale feel about it. 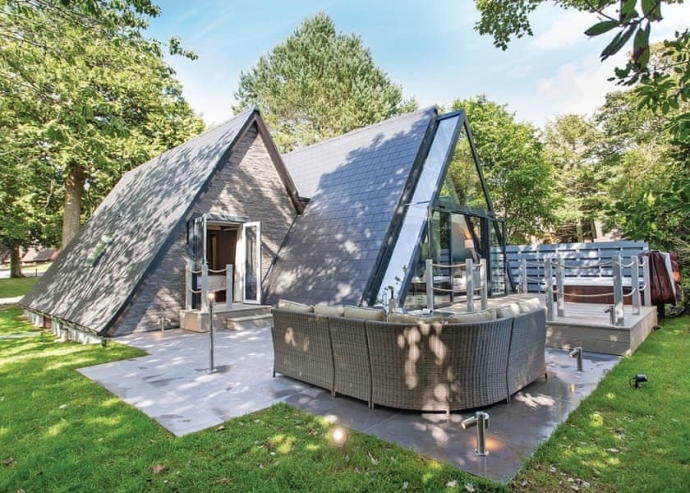 Tucked away on a 90 acre Cornish estate, you can sit in the bubbling hot tub underneath the stars or simply take in the wow factor of the lodges huge windows that merge the interiors with the natural surroundings outside. 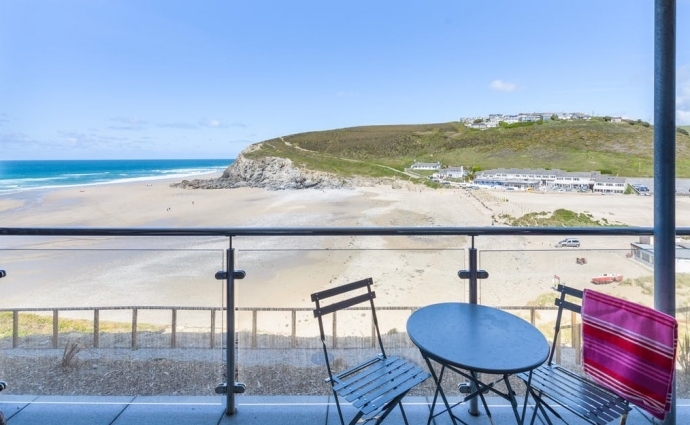 The views don’t come much better than The Beach apartments at Porthtowan. You can sit out on your sea-view balcony, people watch and wait for the sunset, or for the more energetic amongst you, you can put on your hiking boots and head out on invigorating coastal walks and uncover hidden, sandy coves, then come back and have fresh seafood at one of the many restaurants in Porthtowan. Lovely. I first came across the Watergate Bay hotel on a coastal walk back in my teens. Back then it was an old looking Victorian hotel that was lacking charm, modernisation and a connection to its doorstep surroundings. Lots of building work, expansions, and several face lifts later and the Watergate Bay is arguably one of the best hotels in Cornwall. 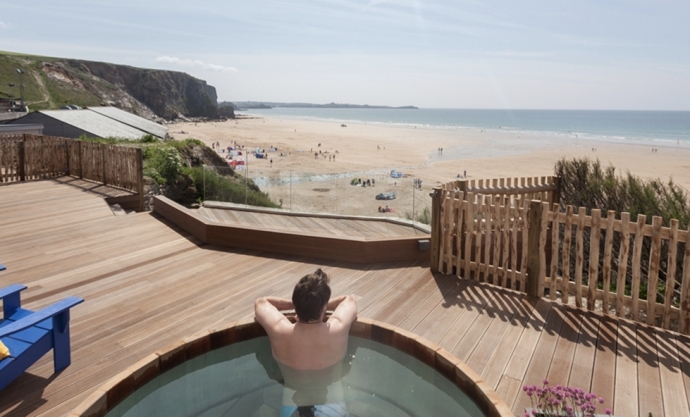 Set a couple of miles North of the hustle and bustle of Newquay, the Watergate Bay hotel is a firm favourite with families, or couples looking for an indulgent retreat. 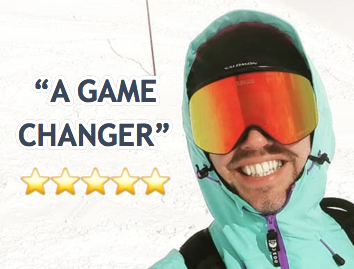 The hotel owners pitch it as a ski resort next to the sea, which is perfect for me! Last but not least, I have to mention the Dunes in Perranporth. Up until October 2016, this site was occupied by the Ponsmere Hotel, a fantastic family hotel that I’d visited almost every year since I was 8 years old. The hotel gave me some of my best holiday memories, and the people I met there are still close friends today. Sadly the family that owned it sold it to developers, and the result is the newly-opened Dunes apartments. 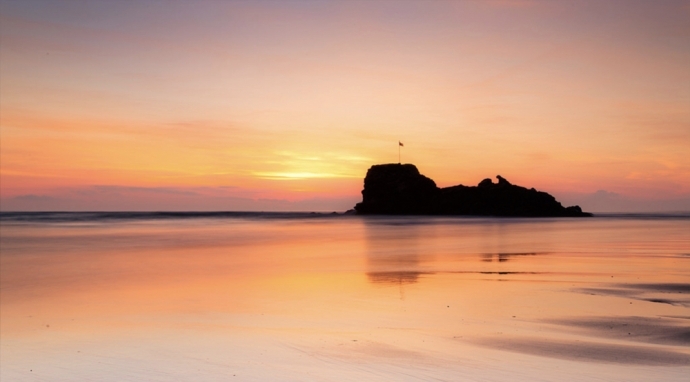 Perranporth is unique, not just for its three-miles of dog friendly, golden sand beach, but it also has the best sunset views in the whole of Cornwall. You write well about the Cornwall attractions. Thanks for the info.